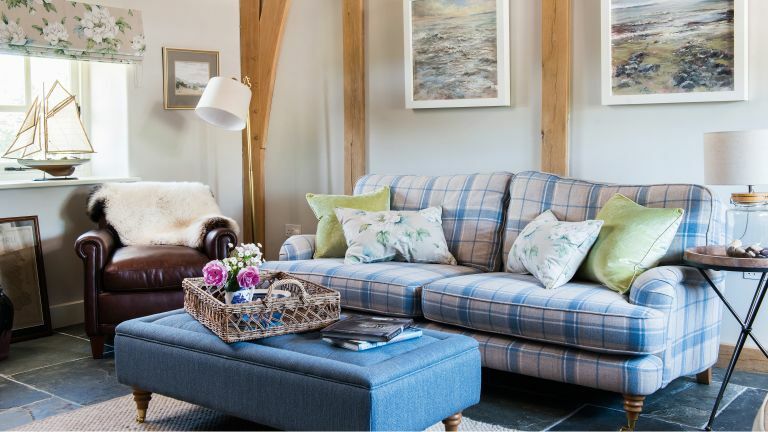 Once a dilapidated cow shed, Soar Cottage is now an elegant period home with a contemporary twist. The work to transform it started in earnest in 2011, when Rosemary Pugh took the plunge to fulfil a lifelong dream. Find out how she achieved this stunning transformation, then browse more incredible real home transformations. Don't miss out on our guide to extending a house too, for plenty of practical advice and inspiration. ‘We inherited the farm and its 180 acres in 1969, from my late-husband Eryl’s father,’ she says. ‘We always said that one day we’d rescue the cottage, but farming and raising a family got in the way. The cottage is built in the vernacular style, from local materials with ‘clom’ walls of compacted earth, straw and small stones. The thatch consisted of heather, gorse and earth clods covered with rushes and local straw. Inside, the layout was that of a typical rural Welsh long house, consisting of a one-room parlour with a bedroom, dairy, cow shed for milking, a calf pen and piggery. A year-long delay followed, as the local council insisted on a full investigation to determine the cause of collapse. In the end, it was concluded that the gable wall was unsupported, and clearing and landscaping the area ready for the renovation works had undermined it. To move forward with the project, Rosemary had to submit a second planning application. The new design had to retain the same floorplan, elevations, and the character of the original Welsh long house, but with an oak-frame sunroom extension, and a smaller addition to create a master en suite, which also incorporated an old tin shed. The roof was insulated next, before the thatchers set to work. They worked tirelessly for five months, and the craftsmanship is clear to see. ‘The thatch is immaculate, one of the best thatched roofs in the area,’ says Rosemary proudly. ‘And it’s not just me who thinks that; most of the locals agree. As the cottage started to take shape, Rosemary decided to call in some expert help to choose furnishings and decor. ‘You can become weighed down with all the decisions you have to make, so having a designer on hand was great,’ says Rosemary, who chose to work with Kay Cullen at the Laura Ashley design service.